Home > Uncategorized	> #howgooglegateworks: Will @senmikelee Investigate Washington Insider Beth Wilkinson for Her Role in the FTC’s Noninvestigation of Google? #howgooglegateworks: Will @senmikelee Investigate Washington Insider Beth Wilkinson for Her Role in the FTC’s Noninvestigation of Google? One of the historical facts that may (or ought to) come up in Senator Mike Lee’s corruption investigation of Google and the Federal Trade Commission is the FTC’s hiring of Washington insider Beth Wilkinson. Ms. Wilkinson was hired to oversee the FTC’s Google investigation on April 26, 2012, four months before the internal FTC report recommending prosecution as reported by Brody Mullins at the Wall Street Journal. Beth Wilkinson has several dots that connect her to various players in the Googlegate corruption probe. —Why Was Ms. Wilkinson Hired? The threshold question is why did the FTC need to bring in an outside lawyer to manage the Google investigation? Has the FTC done this before? (Not that I can find.) Why did they do it this time? Why did they hire Ms. Wilkinson and who else did they consider for the post (if anyone)? How much was she paid and for what work? What exactly did she do while at the FTC? Was the decision taken by the commissioners that there just weren’t enough seasoned professional staff to handle an investigation of Google? What qualifications did Ms. Wilkinson have (who evidently doesn’t have a record of antitrust cases but does have a record of white collar crime expertise)? Ms. Wilkinson is expected to be intimately involved in the FTC staff’s determination on whether to bring a complaint against Google, and she would likely be a key part of any litigation effort. Mr. Rosch said the agency has reached no conclusions in the Google investigation. But he added: “Obviously we would not bring her in if she were going to be completely idle. Mr. Rosch said he worked closely with Ms. Wilkinson in an antitrust case involving hospitals several years ago and recommended that the commission hire her. So Ms. Wilkinson may well have been “intimately involved” in either the preparation or rejection of the FTC report recommending Google be prosecuted. Given her role as a mentor to the agency’s staff, she would be a key witness who could help Senator Lee get to the bottom of the corruption investigation. —Close and Abiding Relationship With Jamie Gorelick, Google’s Main Washington Fixer and Major Beltway Power Player: Jamie Gorelick represented Google in the negotiation of Google’s $500,000,000 fine for violating the Controlled Substances Act that followed a long grand jury investigation in Rhode Island. Ms. Gorelick has also been directly involved in Google’s dealings with Mississippi Attorney General Jim Hood and presumably with the many other state attorneys general who have ongoing investigations into Google’s drug problems, false advertising, human trafficking and other existential problems at the search engine and probably YouTubeistan. [S]erved as the Deputy Attorney General of the United States from 1994 to 1997, during the Clinton administration. She has been a partner at Wilmer Cutler Pickering Hale and Dorr since July 2003. She is a director of Amazon.com. The “Wall Memo” is a very big deal to people like Senator John Cornyn, he to whom Eric Schmidt refused to answer questions in a hearing of the Senate Antitrust Subcommittee that Senator Lee now chairs. After working as an Assistant U.S. Attorney, Ms. Wilkinson was hired by Ms. Gorelick as special counsel to Gorelick when Gorelick was Deputy Attorney General. (Ms. Gorelick was replaced as Deputy Attorney General by Eric Holder, the current Attorney General of the United States.) Ms. Gorelick promoted Ms. Wilkinson to be the principal deputy in the Terrorist and Violent Crime section. Ms. Wilkinson left the Justice Department after successfully prosecuting Timothy McVeigh and Terry Nichols and became a co-chair of the Constitution Project–another connection to Ms. Gorelick. The Constitution Project is also funded by Google according to Public Citizen. Jamie Gorelick was one of the Fannie executives who benefited from inflated bonuses based on Enron-style accounting. She was Vice Chairman of Fannie Mae from 1997 to 2003 (Fannie’s fraudulent accounting scheme was made public in 2004). In 2004, after a tip from a whistle blower who was later fired, the Office of Federal Housing Enterprise Oversight (Ofheo) issued a report finding that the government-sponsored entity Fannie Mae had engaged in Enron-like accounting machinations that allowed Fannie to overstate its earnings and underestimate the risk the company faced. The accounting wizardry Fannie engaged in was designed so that Fannie could meet profit targets to maximize bonus payments to company executives like Clinton administration deputy attorney general Jamie Gorelick and Carter administration assistant director for domestic policy Franklin Raines. Well guess who just happened to join Fannie Mae in 2006? In 2006, Fannie Mae recruited [Beth] Wilkinson as parts of its effort to rebuild its relationship with regulators after accounting scandals and complaints about its corporate culture. Her compensation at Fannie Mae was not disclosed when she was hired. She served as Fannie Mae‘s executive vice president, general counsel and corporate secretary from February 2006 until September 2008. “Her compensation at Fannie Mae was not disclosed when she was hired” is another way for Wikipedians to avoid inconvenient facts. Her compensation is in Fannie Mae’s annual reports if anyone wants to look. Wilkinson was paid over $5 million in eyepopping compensation in 2006 plus an $800,000 “sign on bonus” even though “she knew little about mortgage-backed securities.” Pretty good for government work, eh? It appears that a lawyer who had no experience with what Fannie Mae did as its core function was paid millions in a short stopover before the taxpayer picked up the tab. Again, following her mentor Jamie Gorelick to high office. During an investigation of practices in effect while Ms. Gorelick was in a leadership role at Fannie Mae–that lead to the housing crisis as well as big bonuses for Ms. Wilkinson. Great qualifications to investigate Google, right? —Big Tobacco Cases–Interestingly, Beth Wilkinson also found the time to represent Big Tobacco in 2006…you know, the same Big Tobacco that lost a multibillion dollar class action case to the then-attorney general of Mississippi Mike Moore currently advising Mississippi Attorney General Jim Hood in prosecuting Google. So why haven’t we heard more about Ms. Wilkinson from the Washington press corps? Could it be because she is married to NBC’s David Gregory? Nahhhh. It looks like Senator Lee would have a very legitimate interest in calling Ms. Wilkinson as a witness in his corruption investigation into the FTC’s ties to Google. I’m willing to be educated otherwise, but it looks from the outside that the key lawyer in the FTC with direct responsibility for the Google case might well be deferential to Jamie Gorelick, the indispensable outside lawyer for the very company that Ms. Wilkinson evidently took an oath to investigate. Not only might Ms. Wilkinson might be deferential to Ms. Gorelick, she might well feel downright indebted to Ms. Gorelick for not only her personal wealth from working at Fannie Mae (an odd coincidence) but also significant help with her career advancement while at DOJ and after. And since Jamie Gorelick was replaced by Eric Holder as Deputy Attorney General during the Clinton Administration and since Mr. Holder was the sitting Attorney General of the United States throughout the Google investigation, these people all clearly knew each other and for a long time. There’s an awful lot of smoke for there to be no fire at all. And that’s just the corruption case for Google. It sure looks like somebody somewhere was pulling some strings in the background. Ms. Gorelick is clearly a champion string puller. You may believe in coincidence, but I don’t. 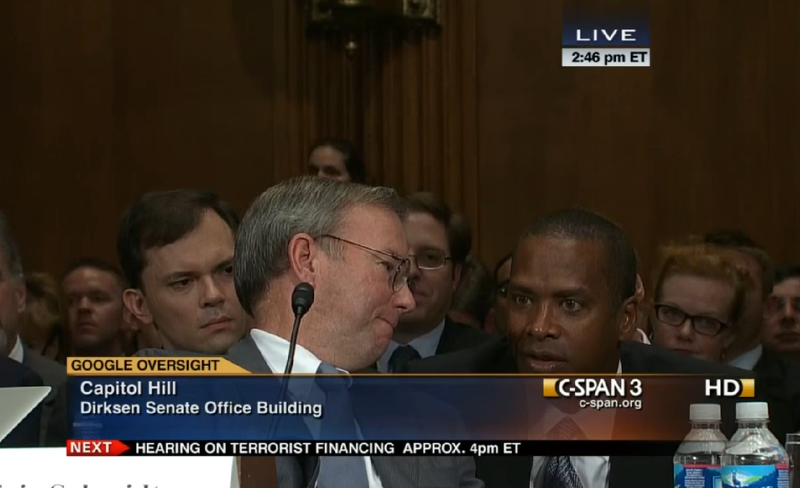 But what I do know–if Senator Lee doesn’t investigate the reliable Ms. Wilkinson, no one else will.